National Institute of Cardio Vascular Diseases has announced New Jobs in Daily Jang Newspaper dated 21-03-2018. Applications are invited for National Institute of Cardio Vascular Diseases Jobs 2018 against the title of Manager Nursing, Nursing Coordinator, Nursing Team Leader, Bio Medical Engineer, Pharmacist, Staff Nurse, Duty Coordinator, Admission Officer, Billing Officer, Store Officer, Supervisor Security, Incharge OPD, Network Technician, Technician Cath Lab, Technician ICU, Technician Echo, Technician ECG, Senior Security Guard, Maintenance Supervisor, Supervisor Housekeeping, A/C Receptionist, Security Guard, Store Keeper, Operator CCTV, Cook, Electrician, Plumber and Receptionist. 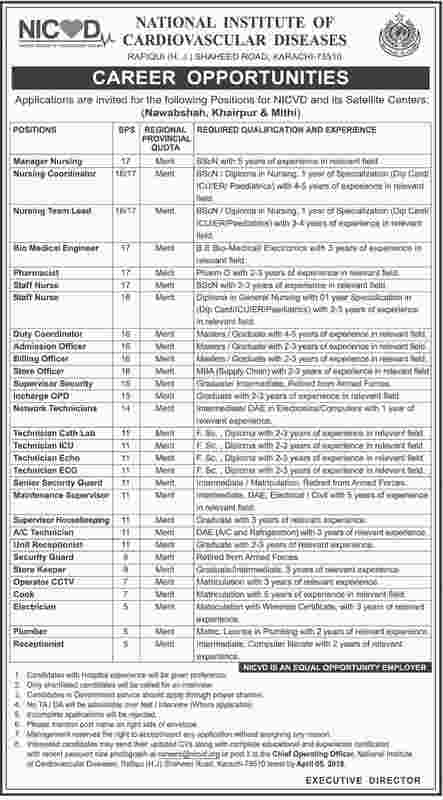 National Institute of Cardiovascular Diseases Jobs Daily Jang Newspaper 21 March 2018.